This travelogue covers a roadtrip a friend and I did in September 2004. 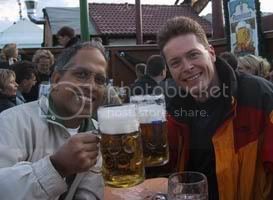 We drove from near London to the Nurburgring race circuit and then on to Munich for Oktoberfest. We drove home via Amsterdam. Psst. Hey, ever been interested in a doing a road trip in Europe? We've been friends since grade eight and grew up talking about things we'd like to do when we were "grown up" so it seemed about time to live some of those dreams. The amazing thing was than in two days we had a holiday planned out and a month later, Sean arrived and on the next day, we hit the road! Before reading about the trip, you might want to watch the music video teaser that Sean put together. We caught the 11:30 ferry run by Speed Ferries over to Boulogne-sur-Mer. They offer a superb service that's much cheaper than other channel crossing options. If you need to go to the continent, make sure you check them out. It only cost £80 to get both of us and the car to France and back and the crossing only takes 50 minutes. It ran on time without any hitches. Highly recommended. We only stopped in Boulogne long enough for me to pick up some euro's from an ATM before jumping onto the A16/A10 heading past Calais, Dunkerque and Bruges to Brussels. But as we approached Bruges, I was just too tempted given it's reputation as beautiful day trip. We took a detour and cruised through the town packed to the hilt with tourists. It's a quaint medeival town riddled with canals. We had a drink and took a short walk around the town before driving on. It took about another four hours of driving to get us to Auderath, Germany. I had heard Belgium is a tedious and boring place to drive and it's true. The only thing that made it interesting was driving fast and cranking the music right up. We drove through the Parc Naturel des Hautes Fagnes which was torture on the suspension but you could tell as soon as we entered Germany. The road all of a sudden was smooth. We drove along hilly rural backroads to Auderath. Very nice area. Very rural. As we got near Nurburg, we ran into a few drivers who considered the region a race track. We had no problems with directions until the very end when we couldn't find the hotel. I called them on my mobile and as the proprietors were British, we had no troubles getting directions. We were soon ensconced in the hotel restaurant with a fine dinner and our first German beer. This was the big day! The most famous race circuit in the world would open for us to drive on it at 1pm. I felt a little edgy, but Sean was quite nervous. It didn't help much when I warned him it was standard practice in motorsports to wear cotton rather than acrylics in case of fire. I had done quite a lot of preparation for this day so I was feeling quite good about it. I had memorized the entire circuit using a combination of playing an xbox racing game (Project Gothem 2) that had a simulation of the circuit and matching it up with a real map of the circuit that included race lines. I had also studied a photo lap sequence. I really must commend Ben Lovejoy on providing an extremely informative Nurburgring website. It was so useful, I sent him a donation. We killed time in the Nurburgring Formula 1 circuit souvenir shop - had to get the T-shirt! Niether of us were very hungry, but we killed some more time nibbling on a light lunch before it was time to go. We got to the parking lot at the entrace of the Nurburgring and it was buzzing. A couple of dozen cars were already there along with a couple of dozen superbikes. It was a quiet day compared to how busy it gets on a weekend. 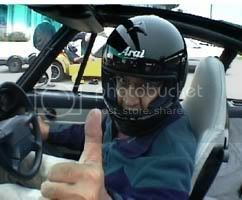 The cost is 14 euro's per lap so I bought two tickets and we battened down the car and put on helmets before edging up to the toll gate. All you do is put your ticket in, the barricade goes up and you're onto the circuit. Unfortunately, you're not allowed to take pictures or video while you're driving on the track. It was a lot of fun. I took it quite easy as I didn't want to misjudge the race line, run out of track and hit a fence or a concrete wall or go over the cliff edge. It happens! There's very little runoff around the Nurburgring and lots of armco. Plenty of other cars caught up and over took me and I didn't attempt to tail them. The Porsche kept its grip in the corners with only an occasional bit of understeer. The car was ready to do more than the driver. The tricky bit was deciding on what gear and when to shift while keeping aware of what was coming up behind me. Before building speed, the important thing is finding the right racing line and with 73 corners, it's a lot to figure out. After the two laps, we were all smiles. The Nurburgring has been described as a rollercoaster and it's quite true. It's hilly with lots of blind corners and hill crests which is what makes it a dangerous circuit. But it's fun! I went back to the office and bought two more tickets. The 3rd and 4th laps were smoother and faster. I felt the racing line improving and fewer cars overtook us. It would have been awesome to spend the day there and remove all the tread from the rear tires but we had a good 500 miles to go that day and it was already 2:30. For your viewing pleasure, here's a video of someone driving the Nurburgring in a Porsche RUF CTR (part1, part2). I handed over the driving to Sean and he soon started feeling confident driving a right-hand drive Porsche in a left-hand country. By the time we hit the unlimited Autobahn approaching Stuttgart, he was enjoying it. I took over driving around Stuttgart and drove the last leg to Munich where we managed to video ourselves doing 145 mph. For a motorway that doesn't have speed limits, the Autobahn isn't as smooth as I expected. It can be quite bumpy. These bumps don't matter at 100 mph but at 145 mph, it makes for a lively ride and keeps your mind incredibly focused. Also at that speed, you have to watch cars in the next lane very carefully for any hint that they intend to move into your lane. A Porsche has incredible brakes but slamming on the brakes at high speed isn't a safe maneuver. So, we never got a chance to get near the top speed of 170 mph. By 10pm, we made it to our hotel in Wessling which just happened to have a cosy little bar. It was a nice way to end to a fabulous day of driving. No more driving for two days. 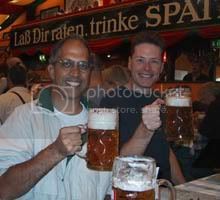 We caught the local commuter train to Munich and made our way to the Oktoberfest arriving before noon. It was pretty quiet which surprised us at first, but it was still morning. We wandered down the main fairway and hopped onto the Ferris Wheel to get a bird's eye view of place. Afterwards, we went on one of the big rollercoasters with five loops which left us with jelly for legs. Time for beer! At this point, I had the naive idea would could have one beer in each of the fourteen tents. First tent, we sat opposite two middle-aged ladies who spoke no English and had our first litre of beer. 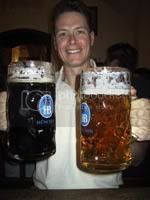 Second tent, we had aother litre of beer at a table to ourselves. After that, we were quite pissed. Mistake! Tried to sober up drinking water and coffee. By the time we were ready for another beer, there wasn't any tables availabe so we sat outside in a chilly wind chatting to some Brits. Then we wandered around to as many tents as we could. I picked two that would be our main tents to hang out at the next day. There's supposed to be over a 100 kinds of beers brewed in Germany so we figured we should try and sample some of them at the Hofbraeuhaus in central Munich. Got there only to find that even they only served one kind - at least during the Oktobefest. We walked around the shopping district of the city centre getting cold. Shopping looks the same anywhere you go doesn't it? Warmed up by buying a sweater and having a latte. Found out later that the weather was unusually cold that week. Time for a beer! We made our way back to the Oktoberfest grounds and were very lucky to squeeze onto a table occupied by a large group of Germans who, again, didn't speak any English. No problem. Beer is a universal language and it was a very jolly crowd. I should take a moment to praise the traditional Bavarian Dirndl dress. It can look absolutely fabulous on the right girl. Very uplifting. Lots of people were wearing traditional costumes and we even met one named Heidi. After two litres of beer, we poured ourselves over to another tent full of wild foreigners. Overall, everyone is very well behaved. I don't think you could hold a beer festival like it in Britain. It would just get violent and completely out of hand. The Germans just drink, sing and are happy. Oktoberfest shuts down around 11pm and by random chance, we later found ourselves at a bar called Coyote Nights. It was a small place but featured a lively show on the bar - anything from wet T-shirts to beautiful women dancing on a burning bar. No hang over! Not bad. The secret is to just keep drinking lots of water and resign yourself to a bazillion trips to the Gents. I just felt a little "delicate". We were back on the road but the weather was crap. With high winds and heavy rain, it kept our speed down to British standards of slow driving. Of course, this is still faster than driving in North America. We even got caught in a few crawling traffic jams that made me feel like I was back at home. We spent the whole day just driving, chatting and listening to music with only a few breaks. At one point, I cranked up Autobahn by Kraftwerk; it had to be done! The most significant break we made was a short stop in Rothenburg. Rothenburg is considered one of the most picturesque towns in Germany. I knew it was important because there's a minature version at Legoland! Yep, it's quaint and medieval and full of Christmas shops. If you want baubles to decorate your Christmas tree, it's the place. Germans know how to decorate a Christmas tree like no one else. It is their invention after all. We arrived in Cologne around 10:00 pm and found a hotel and some dinner. We briefly admired the mighty Rhine as we left Cologne early heading to Amsterdam. The weather was good and we had a last taste of Autobahn speeds as we approached the border with the Netherlands. In the last few days, I had completely revised my opinion of Germany. It's actually a very nice country and worth touring. It's pretty boring driving around the Netherlands. The most entertaining thing you can do is count windmills. We eventually made it to the Centrum district of Amsterdam before the boredom congealed. At first we tried driving around looking for a nice hotel and then a place nearby to park. This didn't work as you simply can not find parking. In fact, I tried squeezing into a very tight parking spot at one point and tragically discovered that the car in front had a towing bar after it smashed through my front right indicator. Doh! At that point, we switched strategies. You have to first find a parking spot and then look for a hotel nearby! We soon discovered a superb underground car park at the Stadhuis Muziektheatre Stopera. Most hotels were full, but we eventually found one and checked ourselves in by 4pm. We were within easy walking distance to the centre of Amsterdam. If you notice in the picture, there are no safety rails stopping people from falling in the canals. You park right by the edge and you watch your step. And if you did fall into the canal, notice there's no way you're going to climb out! There's no steps or ledges or anything to help you except the moored boats. Now, in Canada or the US, there would be safety things all around it to protect you but not in Europe. I like that. It keeps natural selection working by killing all the idiots. To describe Amsterdam as liberal is like saying there's sand in Saudi Arabia. It's liberal with a skyscraping capital 'L'. I'm not going to go into details of our Friday night but I'll just assure you that two fellows can find plenty of entertainment in Amsterdam. 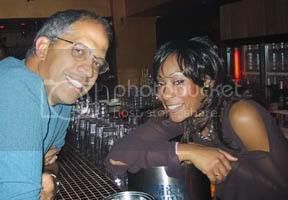 Here's a picture of Charlene, one of the lovely bartenders we met. Despite having very little sleep, we made it to breakfast before 10 and checked out early. We were heading out of Amsterdam by 11:30 back to Boulogne-sur-Mer to catch a 5:30 ferry home. It took about 4 hours to navigate the web of motorways to get there. We arrived early enough to enjoy a very late and very French lunch before joining the ferry queue. So, it was a good road trip. The Nurburgring was great although it would need quite a bit more practice to do it justice. In some ways, the Autobahn was even better. It certainly allows you to get from place to place quickly, but I just wish it was smoother. 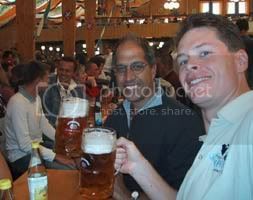 The Oktoberfest lived up to my expectations although it would have been nice to sit with people who spoke English. The best part was just absconding from all family responsibilities and hanging around with a best mate whom I hadn't spent a lot of time with for many years. If we had more time, I would have loved to have driven further. Prague is only four hours drive from Munich; North of Prague is Berlin. Munich is right at the foot of the Alps. We could have easily driven into Austria and Italy wasn't that far away. Hmmm. Driving in Italy? You would have to go in a Ferrari wouldn't you? Now wouldn't that be cool! Heya me and some of my friends are planning on doing the same trip to the nurburing. on the 11th of march but are finding it hard to find information on where it is, how to get their, when its open etc. if you can help in any way could u please email me at JOESNIFF_OWNZ_YOU@HOTMAIL.COM we are also next to london in essex so would basically take the same route as you. so if you could email me maps? or webapges with info about it. it would be a great help. Hi, i am looking to take my boyfriend to this track as it is a major dream of his. Im not sure when it would be but any information you have on openings, prices, directions etc would be a fantastic help. If you could please email me at ickledevil44@hotmail.com. Im looking to take my friend to this track as it is a major dream of his. Im not sure when it would be but any information you have on openings, prices, directions etc would be a fantastic help.